Another post that was hiding in the archives from last year. 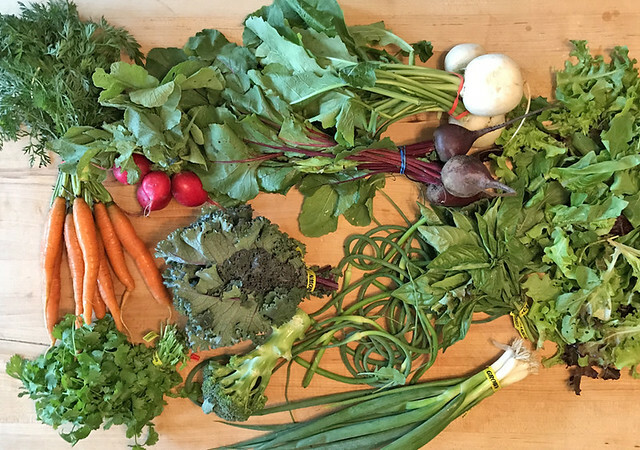 This summer I opted to give CSA a try. I was hesitant in years past because of the horror stories I’ve heard of too many vegetables and so much waste. The tipping point was this CSA, Shared Ground, offered up half orders. That was just the ticket. It’s been a month since I’ve started and I haven’t had any problem using up my rations within a week. 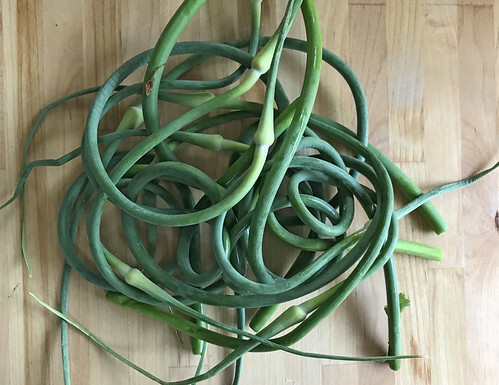 The first box had these crazy Garlic Scapes in it. I’d heard of them, but had never worked with them before. I went to my trusty website Eat Your Books that has all my cookbooks in it, and it conveniently will do a search for an ingredient, a recipe etc… that I’m looking for. What a treat! I gave it a try and proceeded to put this stuff in everything! I was so excited that there were more garlic scales in the following weeks box that I made it again! I need to freeze some and hoard it away for winter. HA! It will never last. JP raved about Garlic Soup after you h guys saw Fred. Thanx for the recipe!